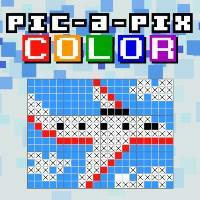 A budget-priced downloadable Color Picross game. The visuals and soundtrack are a bit unpolished, but they get the job done and you really don’t need more than that for a Picross game. The game comes with 150 puzzles ranging up to 20x20 in size, though the largest of these are a bit awkward on the 3DS with the vertical clues displaced to the top screen. There are also several DLC packs available with puzzles grouped by size, the largest of which go up to 35x25 and are only available on the Wii U and not the 3DS. The fact that there is so much DLC available at a per-puzzle cost double that of the base game feels a bit mercenary - or rather, it would except that the base game is inexpensive, is cross-buy on 3DS and Wii U, and comes with a substantial number of puzzles anyway. Really this means you can get in for cheap and if you like it you can spend a bit more and support the developer. Puzzles are all played with Free rules. Hint-Number Auto-Check is on by default but can be disabled. There’s also a feature which lets you check at any time whether your current solution is correct so far (though if you’re paying attention to the Hint-Number Auto-Check this hardly seems necessary) and the game gives you a medal for each puzzle you solve without using this check. I admittedly haven’t played many Color Picross games and can really only compare to Hungry Cat Picross - against which Pic-a-Pix Color stacks up favorably. There are enough small puzzles to warm up on but the later puzzles get large and complicated and are thus more rewarding to play, and the available colors are always easy to tell apart. For someone like me who enjoys Picross but is finding the standard formula a bit stale, this game is a nice change of pace. I Stopped Playing When: I finished the game by solving all included puzzles. I did not buy any DLC puzzles. Three Stars: Good. I liked the game enough to finish it (or just play it a bunch, for games that don't end). I recommend it to most genre fans.